Philip: We told you so. Hi, this is Philip Blumel, President of US Term Limits. 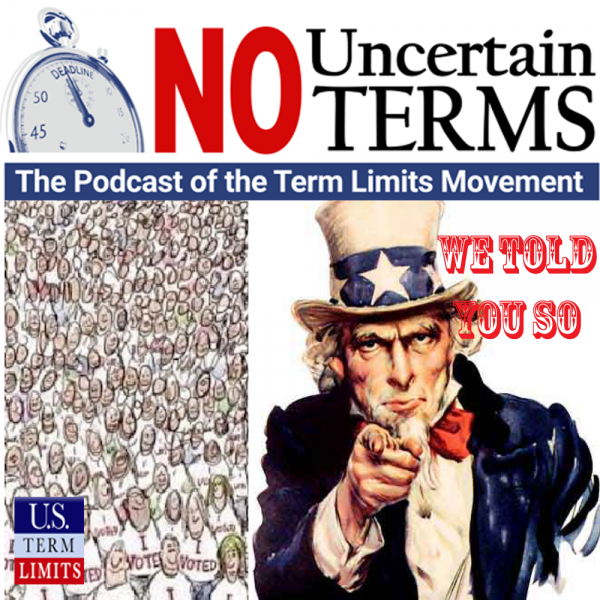 Welcome to the No Uncertain Terms podcast for the week of November 12th, 2018. Speaker 2: Your sanctuary from partisan politics. Philip: Last week, we made the bold prediction that incumbents would win the November sixth elections in a landslide. They did. Perhaps that wasn’t too interesting a prediction, given that since 1970 about 94% of incumbents running for their own seat have won. Every congressional election is a landslide. As we pored over the results of last week’s election, we did uncover quite a few interesting artifacts to share, ones they don’t talk about much on cable TV. To help me parse them is, again, Nick Tomboulides, Executive Director of US Term Limits. Hey, Nick. Philip: So, to put a fine point on it, how did the incumbents do the other day? Nick: Well, if you only pick up the newspaper and turn on cable news, you would think that Congress was permanently transformed on Tuesday, that a massive wave swept through the body, swept through the two chambers, and knocked off quite a few incumbents, but that isn’t actually the case at all. When you delve into the data, you find that incumbents won this election resoundingly, just like they win every election resoundingly. In the House, 97% of incumbents were re-elected running for their own seats, which is actually higher than what the average has been for the last 40-50 years, and in the Senate, 93% of incumbents running for re-election won. Nick: So, yeah. We’re hearing that it’s a big wave election, but it really just seemed to give a lot of incumbents their seats back. It’s not much different from what we’ve seen in years past. Philip: Quite right, and you know, again, as usual, these elections generally were not closed either. When you look at the number of seats that were competitive, that had let’s say a range of about 10% between the winner and loser, eight percent of the seats in the House were competitive if that’s the measure. The average winning percentage in the House was 66%, so I’m not seeing a big amount of change in the Congress as a result of this election. 43 seats in the Congress were not even challenged at all, there were no elections held. In fact, that’s true even in my district. I live in south Florida and my Congresswoman is Lois Frankel, and she had no opposition. We live in a strongly Democratic district and no one bothered to run against her in the general election. Philip: And you mentioned in the last podcast that often that means only one person will appear on the ballot. In Florida, no one appears on the ballot. So, for the race of US Congress, which is supposed to be an election every two years in the House, no one appeared on my ballot when I went to vote. Nick: Well someone did appear on my ballot, but it wasn’t a candidate who could actually compete with the incumbent in terms of fundraising and name recognition, so even though there was nominally a challenger for my incumbent here in Florida, he was re-elected with, I believe, over 60% of the vote. So, as you mentioned, uncontested races are always a huge problem, and in this election we actually had more uncontested races than we did seriously competitive races. Philip: We did. Quite right. Nick: But under-opposed, under-contested races are also an epidemic in this country and that accounts for the vast majority of congressional races where an incumbent does get a challenger, but it’s basically someone who has just filed the paperwork, isn’t running a serious campaign, isn’t raising big money, and doesn’t have a chance. That’s why the average incumbent won this cycle with 66% of the vote. These were landslide races, they were not even close in most cases. Philip: That’s right. The amount of change that we did see was largely a result of retirements. There were a large number of retirements and that made up most of the open seats and most of the competitive elections. Now, of course, at US Term Limits we’re trying to do something about this. We’re trying to encourage rotation office and competitive elections through establishing term limits, and one of our primary strategies is our pledge programs, and so on these podcasts we have been giving you updates on how the pledge program has been going. Here’s our latest. Scott: Hello, this is Scott Tillman, the National Field Director with US Term Limits. Every election cycle we ask candidates for Congress to sign the US Term Limits pledge. That pledge reads, “I pledge that as a member of Congress I will co-sponsor and vote for the US Term Limits amendment of three House terms and two Senate terms and no longer limit”. This year we had a lot of people sign the pledge. We had over 379 congressional candidates sign the pledge. Of those, 136 were on the ballot last Tuesday. Of those 136, we have confirmed 64 winners, that’s 50 in the House, four who ran for Senate, and a couple pending in there. Scott: So, going into this session we’re going to have at least 50 and maybe 51 House signers and then with other senators that are already elected we will have at least 14 and maybe 15 senators in the US Congress this coming January who have signed the US Term Limits pledge to help us get term limits on Congress. It’s a big, exciting year and that’s a big, exciting number. Scott: We also do a pledge program where we ask state legislators, people running for your state House and Senate. If you live in Michigan like me, it would be people running for the Michigan legislature, Michigan state House, Michigan state Senate. We ask these candidates to sign a pledge to help us get term limits not on the state, but on Congress. That pledge reads, “I pledge that as a member of the state legislature, I will co-sponsor and vote for the resolution applying for an Article V convention for the sole purpose of enacting term limits on Congress”. Scott: We had a really big year for article five pledge signers this year. Over 350 candidates signed the pledge that I just read. On Tuesday, 241 of those candidates were still in and on the ballot. Of those 241, 130 were elected. That’s 130 out of 241, a big, big number, and we have three yet pending, so we actually have more than 130. The biggest winners back on Tuesday for pledge term limits on Congress were the people of Georgia who had 27 House members and five Senate members sign our pledge, people of West Virginia who had 17 House members and two Senators sign our pledge, the people of Maine who had nine House members and three Senate members sign our pledge, and the people of Arizona who had eight House members and two Senate members sign our pledge. Scott: We actually have pledges from people in 19 different states and that’s because this is the first year that we ran that pledge program. Next year or next cycle we expect even more. This is a movement that’s growing, it’s getting bigger and bigger and we’re very excited that we had such a big year for our first year with this pledge. Philip: So Nick, what do you think? Nick: What’s amazing about this is the fact that Democrats have taken over the House of Representatives. I believe they now have 225 confirmed seats to about 197 for the Republicans and there are still quite a few, over a dozen at least, that are uncalled. So, it was a historically significant election for the Democrats. They did take control of the House of Representatives. Democrats now have 225 seats to about 197 for the Republicans and there are about 13 races that are still, as of yet, uncalled because they’re still tabulating ballots. But despite the fact that party control of Congress shifted, well at least in the House, the number of US Term Limits pledge signers actually increased, went from about 57 between the House and Senate to between 63 and 65, depending on the final results. So there will be more US Term Limits pledge signers who have committed to co-sponsor a constitutional amendment for term limits in the next Congress than there have ever been before. Nick: This movement is absolutely on the upswing and the takeaway is that term limits is an issue that really transcends party. It doesn’t matter who controls the House and Senate. The momentum on this issue will constantly be moving upward because the American people support it regardless of party. And we’ve seen that more now. We’ve seen there are new Democrats entering Congress, there’s Ann Kirkpatrick in Arizona who just won a seat out there. There’s Lori Trahan in Massachusetts who just won the third district out there for the House, who have signed the US Term Limits pledge. So you’re gonna see a bill in the next congressional session with a record number of sponsors and co-sponsors as well as strong bi-partisan support. Philip: That is really exciting, and don’t forget, the same thing’s happening on the state level. We didn’t have a pledge program on the state level until recently. So with getting 130 state legislators around the country to sign the pledge in our state capitals, that’s another big step forward. I have to tell you Nick that I am more excited about the term limits movement right now than I ever have been, and of course I’ve been involved in this fight for a long time, because this strategy of getting these legislators to sign the pledge and then of course following up and these politicians, when they sign the pledge, they do follow up and co-sponsor the bills. When we get them on these bills, we’re building momentum, moving towards a critical mass, and with the pressure coming from the states with more and more states calling for a term limits-focused amendment-writing convention, I see that this is a strategy that is working and we saw it again on November sixth. The numbers are there. Nick: Justifiably so. You should be excited about this. This is the first time the term limits movement has ever really had the one two punch of action at the federal level in Congress toward proposing an amendment as well as at the state level, which creates the pressure, the leverage that you need ultimately for Congress to take action or for the states to go out and propose the amendment on their own. Not only did we have 130 winning pledge-signers in the states, but we had decisive pledge-signers and I will give you an example. Arizona in 2018 came within a hair of passing the term limits convention resolution. It got through their state House, it didn’t get through their state Senate. But this year the grassroots organizing team of US Term Limits out in Arizona managed to secure a pledge from the incoming Senate president, Karen Fann, that she is totally on board with the term limits convention, it’s gonna be a priority of hers when she takes office, and so now we have very strong chances of success out in Arizona as well as other states like Georgia and West Virginia and Tennessee where we’ve seen a spate of pledge-signers come into office. So it is a very promising time to be a part of this movement and the states are gonna be very active next year. Philip: Isn’t it an obvious conflict of interest when politicians put a measure on the ballot to weaken or repeal their own term limits? In 2012, citizens of Kettering, Ohio collected signatures to put an eight year term limits measure on the ballot. It passed with over 60%. Four years later, with a simple council vote, the politicians put in the anti-term limits measure with tricky language on the ballot to try to undo the citizens’ work of four years earlier. Well, this is an old, old story we’ve heard before. If citizens alert their neighbors to the threat in time, these schemes rarely work, but then who knows, a few years later politicians will probably try it again with new and trickier language and use public resources to try to get it passed. And they’ll try again and again until they get the answer they want. And why not? They don’t have to collect signatures in the hot sun, they just vote. Philip: In Nashville, Tennessee for instance, council members earlier this year placed an anti-term limits measure on the ballot for the seventh time since voters approved term limits, overwhelmingly, back in 1994. Once again, Nashville citizens shot it down last Tuesday. But in Kettering, Ohio, citizens didn’t just vote no back in 2016, they made a little bit of term limits history. They put an initiative on the ballot that recognized the conflict of interest involved in politicians forcing citizens to defend their term limits law over and over again. They put a measure on the ballot that prohibited the council from proposing amendments that seek to alter or abolish any provision in the charter that addresses term limits, their own compensation, or the initiative process. Proposals to change these things must come from the citizens themselves. This conflict of interest amendment passed with 64% of the vote. That’s even higher than the original term limits measure. Philip: We talked to the author of this revolutionary idea, Ron Alban, founder of Citizens for a Better Kettering, last week. Ron: Hello, Phil. Thanks for talking to me. Philip: Sure. So, Ron, where did you get the idea for this conflict of interest amendment? To my knowledge this has never been done. Ron: Well, there are many examples of constitution in charters placing limits on government, especially where there’s a history of a power the government has abused and this was simply a specific exercise of the peoples’ right to limit government through their charters and constitutions. Philip: Okay, so basically you took this abstract idea and applied it to this specific problem that you’re running into in Kettering. Ron: Absolutely and it was very common sense, so everybody understood it and of course passed it by a very comfortable margin. Philip: Yes, it is common sense. In fact, when I first heard it hit me like a ton of bricks because the first thing I thought of is why aren’t we doing this all the time? Philip: I noticed that the conflict of interest amendment also states that any referendum, whether it’s passed by the council or by the citizens, has to be submitted to the voters only at a general election. What does that mean and why was that included? Ron: Well, it’s been very, very frustrating to many Ohioans and perhaps it happens in other states, where these councils or legislative bodies put important proposals on low-turnout special elections or primary elections. Ron: The purpose of that is to try to get it passed by a very small minority of the voters. Philip: They can get their cronies out to the vote and overwhelm the people that hardly even know about it, probably. Ron: Right. So this just makes clear that anything as important as a charter amendment or a constitutional amendment should go on a high turnout general election. Philip: Yes, that’s a trick that politicians also play around the country. Ron: There’s a lot of tricks, you know, in our case. The main thing is when something like this happens, the voters have to be educated in advance. And so we mounted a campaign well in advance of the election to make sure everybody understood what was in this package of proposals from council. Philip: Well that’s key, making that campaign and educating the voters, that’s really what you need to do to overcome these political tricks. Philip: Here’s the most exciting thing about this idea to me, what if you had included this conflict of interest provision in your original term limits measure? How would that have changed the Kettering story? Ron: Well, this attempt only four years after the term limits were put in place would not have been possible by council. Now, I want to emphasize that council members, as residents and citizens of Kettering, have the equal opportunity to propose a change to term limits, but by the initiative. Philip: Oh, sure, because they’re citizens also. Ron: They’re citizens also and if they can go out and interact with their fellow citizens and get the required number of signatures, they can absolutely propose a change. Philip: You know, when it comes to term limits referenda, I’m a firm believer in the KISS principle, keep it simple. The power of term limits is that it’s easily understood, easy to explain, and something citizens can do and because it’s simple and short it fits in a referendum format quite properly. I usually advise citizens who come to me saying what do you think about this initiative I’m trying to launch. I like the idea of sticking with tried and true, six or eight year term limits, often avoiding retroactivity. I think that’s an extra complication that’s often not helpful. But I’m warming up to the idea of recommending including a conflict of interest provision like this to standard term limits measures because we see this kind of chicanery that you’ve seen in Kettering in cities all over America. Ron: Yes, I agree with that, and while it’s no cost to council members to do this, it’s a tremendous cost to try to then educate the public, the voters, on the various trickery that’s involved. It’s an effort to fool the voters into rescinding term limits. And so it wastes a lot of time, a lot of money, a lot of energy, and that’s another reason to just put a stop to it before it starts. Philip: Right. You’re saying it imposes costs on citizens. Philip: Yeah, sure. Now here’s my concern about this and one thing that we’re gonna have to investigate further, has this measure been tested in court? Like I said, it’s the first one I’ve heard. Is there any talk of them trying to pass another anti-term limits measure on the ballot in contradiction of this rule? Ron: No, there hasn’t. There’s not been a court challenge. I think as a matter of practical politics it would be viewed extremely poorly by the citizenry if an existing member of council launched a court challenge, but that’s always possible. Philip: That’s a good point because a politician trying to overturn a conflict of interest measure when they have a conflicting interest, the politics of that are pretty poor. Ron: They are. They are. Philip: That’s one protection this measure has then against the courts is that it looks so bad trying to challenge it. Ron: Yes, that’s right. Most states, including Ohio, have a pretty strong what’s called “home rule” provision in the state constitutions that grants a high degree of autonomy to local and townships to run their own affairs as they see fit, and I believe our provision falls safely within home rule and we think it’ll stick. Philip: Great. Well, at US Term Limits we’re gonna pursue this idea further. And if it becomes a standard provision in future term limits initiatives or at least a relief for beleaguered voters like in places like in Nashville, where every couple years they have to go back and fight the same battle over their term limits law, let history show that Ron Alban did it first. Speaker 6: This is a public service announcement. Philip: US Representative Ro Khanna, a Democrat, has represented California’s 17th Congressional District since 2017. Khanna only accepts donations from individuals and is one of only six members of the House and 10 total members of Congress who do not take campaign contributions from political action committees, PACs, or corporations. Representative Khanna won his re-election last week. He spoke to his colleagues on the House floor on March 22nd, 2017, in favor of congressional term limits. Ro Khanna: I don’t think term limits are a partisan issue. The Economist had an article that the turnover rate in the people’s House is less than European monarchies. European nobility turn over at a faster rate. Incumbency re-election is 96%. When folks say why can’t you just vote people out of office, it’s not looking at the actual statistics. 96% of folks here are re-elected and that is not what our founders intended. James Madison and Alexander Hamilton agreed, the security intended to the general liberty consists in the frequent election and in the rotation of the members of Congress. They envisioned a place where people would come, serve, and go back home to their communities. Thomas Jefferson said that people ought to live, lawmakers ought to live, under the laws that they pass. The only way we get back to our founding ideals is if we pass some version of term limits so that people do their public service and then return to the communities where they reside. This bill against term limits is really a move against political dynasty. Philip: We also saw some action at the state and local level. Every two year election we look at the different referenda and initiatives that have made it to the ballot. There’s two kinds. There’s the ones that establish new term limits, usually put on, nearly always put on the ballot by citizens, and then there’s anti-term limits measures that weaken or try to abolish term limits, and that’s always put on the ballot by politicians and legislatures. We compiled and we’re not quite done collecting all these statistics, but it looks like right now we’ve tracked down about 50 across the country and we have an 80% victory rate. So, 80% of the time the pro term limits position won on November sixth. Nick: But you need an asterisk next to that number. Nick: Because the 20% of the time when term limits lose, well at least they don’t typically lose 20% of the time, but this year they did, not because voters have changed their minds about term limits. Be not deceived. Don’t think voters have changed any of their beliefs about term limits. Term limits only lose at the ballot box when politicians use a mischievous, fraudulent, ballot title or fraudulent ballot language that misleads voters into thinking they’re voting for term limits when in fact the outcome would either weaken or abolish them altogether. And we saw examples of that this year like in Polk County, Florida, for example. Voters in Polk were given a ballot question that said it would be creating a 12 year term limit for the county commission. They thought that was a great idea, so they voted for it in a super majority. Problem is the Polk county commissioners have had eight-year term limits for a long time and the voters were not told that. They were not explained that by voting yes they were actually lengthening the term limits from eight to 12-years, so it was a total fraud, total scam, total deception, and the politicians were able to get away with it. When term limits lose at the ballot box, get lengthened, extended or repealed in some very rare cases, it’s only because the politicians are being dishonest almost 100% of the time. Philip: And you know what? Nick, what worries me is that they’re getting better at it. For one thing, we’ve followed these referenda every election cycle and in 2016 there was about 40 on the ballot and every single time in 2016 term limits won. In 2014, we had a 90% victory rate. 2012, 97%. 2010, 97%. And this is the first time we’ve seen the number as low as 80, which is funny because with most issues, 80% would be a fantastic victory rate, but for term limits it’s not. It actually spooked us a little bit. But you’re right, the number of successful scams is increasing, the politicians are getting better at it and they’re looking at what works elsewhere and then trying it in their own locale. But, like you said, it’s not the voters. The polling hasn’t changed on term limits. And also, by the way, the ones we’re winning, that is the ones that have straightforward ballot titles, we’re usually winning by large percentages, as usual, ’cause it’s very typical for term limits to win on the ballot with a 70% average, which we did again this time in our winning races. Philip: In the ones we lost, it’s always really close because it’s always a battle between the politician’s trick and getting the word out in time. And sometimes we make it and sometimes we don’t. In Polk, there was no opposition. It was the only real major loss across the country that I’ve seen so far. Nick: You know, it’s been said there are two certainties in life, death and taxes. I actually think there are four certainties. Death, taxes, citizens clamoring for term limits, and greedy politicians trying to repeal those term limits. Philip: In episode number six of this podcast, we interviewed Zack Maxwell, the leader of a citizen effort in Arlington, Texas that collected 11,000 signatures to impose six year term limits on the Arlington City Council. The council fought back against the citizens at first by sending city workers out to interfere with the signature gathering. And then trying to sponsor a rival measure, suspending the city rules to get the rival measure on the ballot at the last minute. But the council backed down from this in the face of citizen opposition at a crowded, Sunday night council meeting called specifically by the council politicians to fight the citizen initiative. In spite of a campaign that tried to label term limits extreme, 63% of the voters approved the term limits on November sixth. We spoke again to initiative leader, Zack Maxwell, last week after his victory. Philip: How you doing, Zack? Zack Maxwell: I am tired. Philip: I don’t doubt that at all. I wanted to congratulate you. That was a fantastic victory. The council and their cronies really put up a fight. When I spoke to you last, their scheme to suspend the city rules to adopt a rival measure had been beaten back by citizens not to mention a judge. What was their next method of attack? I know they didn’t give up after that. Zack Maxwell: Oh, sure. Well I mean we did get our proposition onto the ballot alone, which was key. And you’re right, a judge did hand us a restraining order against our mayor for what he did in that particular scenario. So, once that was on the ballot alone, it became a campaign. And at that point our opponents raised over $300,000 and did everything they could under the sun to scare the public. They ran on a campaign that was based on fear and deception and lying. Philip: That’s not too unusual. Zack Maxwell: Well the entire narrative that they promoted was this idea that I had deliberately misled the public. And that basically the public was just too dumb to understand what they had signed up for. And they also, my favorite part, is their glorious marketing scheme which was to tell the public vote “no” to this and we’re gonna build a committee to come up with a smarter plan. Philip: Right, so they’re trying to say you’re extreme. But if you vote no on this term limits measure, we’ll put together a term limits committee to give you a better term limits measure. I guess that was their pitch. Zack Maxwell: Right. I was an extremist. I was called a radical. I was called a racist. They were seriously paying a girl to run around the polling stations and tell black voters that I was a racist. Zack Maxwell: One former councilperson actually got on my social media site there and made a comment to the effect of if I would just throw myself into the back of a garbage truck, it would take care of the big problems for Arlington. Zack Maxwell: This is a former councilperson. Philip: Right. Well I know it was satisfying when those returns came in. Around US Term Limits headquarters, of course, you’re a hero and a winner. At what point during the campaign did you realize you had this thing won? Zack Maxwell: That’s kind of a catch-22 question because I didn’t take on the campaign without a clear understanding that we would win. Zack Maxwell: So, from the time we collected the first signature, our strategy was get it to the November ballot. If we can get into the November ballot we can win. Philip: Right. They needed $300,000. They still lost. How much did you spend? Zack Maxwell: Well let’s be clear, we didn’t spend anything to get it on the ballot, that was also citizen manpower. So all that we did, we spent a minor amount, I would say 1000 on, well maybe 2000 bucks, but the point is that through it all, we probably spent under $10,000. We did this with 1500 yard signs. We organized over arguably 120, maybe 130, volunteers through the course of the entire movement. It was manpower. It was amazing to see during early voting how we would have maybe at best two volunteers at a station and they would stack it with seven or eight. Philip: Well, our experience is that straightforward term limits measures like yours always win. So, you were right, if you were successful getting on the ballot, it’s almost certain you’re gonna win. So if you were committed at the beginning to collect the signatures you needed and of course to put up with the harassment, it was always inevitably a win. Which, not to take anything away from all you efforts, but you were right from day one. Zack Maxwell: They were aggressive and I took a beating. But at the end of the day we won and the winners are in the history books, like they say. And so, we are obviously, the whole campaign, not just myself, everybody in this campaign is just elated with the results and the ability to accomplish this. Philip: I read a headline that suggested that the mayor of Arlington hinted that this battle might not be over. What do you think that means? What do you think he’s up to? Or is he just talking? Zack Maxwell: I know what he’s up to. In his own mind, refused to accept the results of this election and now they’re playing the sore loser game, which is well let’s try to de-legitimize the election by forming this committee and then they’re gonna come out with a staged outcome that we already know what it is. You actually can’t change your charter again for two years. So even though he wants to form this committee and they could come out within three, four, six months with some kind of alternative plan, the reality is that he can’t do anything with that for two years. Zack Maxwell: In two years, with a simple majority vote of the city council, they can add a proposition to a ballot and we just have to hope that the voters are smart enough to see through what will likely be an incredibly deceptive campaign down the road. Philip: Now I just interviewed someone in Kettering, Ohio. They were faced with this problem of the council coming back and putting on another measure and making them fight the same battle over and over again. And they put an initiative on the ballot that restricted the council from referring any referendum to the ballot on the issues of term limits, their own compensation, or the initiative process. Very interesting, and it passed overwhelmingly. Zack Maxwell: I love that. Philip: It actually passed with a higher percentage than the original term limits measure passed, and he’s calling it a “conflict of interest amendment” and how could you be against that? Zack Maxwell: That’s an interesting solution. I’m glad we had this conversation because that may be something that we approach in two years. We may actually, as citizens, bring forward an amendment like that to our charters. That’s a good solution. Philip: One last thing, what one thing have you learned from this effort that you’d like to share with term limits activists around the country who might be thinking about doing the same thing? Zack Maxwell: I would say just because you may not agree with someone politically as a Republican or a Democrat or Libertarian, however you identify, reach across the aisle and make friends with those that you don’t agree with. Because what we found in this campaign was that it took a coalition of thinkers across an entire spectrum of political ideologies to get this done. And so, that was maybe one of the most unspoken, unsung melodies of this entire movement was the way that we were able to bring together all of these people from different backgrounds, creeds, races, religions, political ideologies, and we were able to accomplish something for the greater good of our community in a time when our country is so severely polarized on a national level. Philip: Conflict of interest provisions might be the wave of the future in the term limits movement. We discussed the Nashville, Tennessee and Kettering, Ohio cases in today’s podcast and somewhat coincidentally a letter to the editor appeared in the Wall Street Journal on Saturday on this very subject. Reader Sterling Abernathy of Kettering wrote, quote, “The voters of Kettering, Ohio, aren’t as willing as those of Nashville, Tennessee to endure decades of self-serving schemes by their council to undo term limits. An initiative campaign put an amendment on the ballot to prohibit future councils from proposing amendments pertaining to term limits. Perhaps Nashville area voters will follow Kettering’s lead,” closed quote. Philip: Indeed, perhaps Memphis should also, as they too on November sixth voted down another anti-term limits measure put on the ballot by scheming politicians acting in their own interests and imposing costs on citizens. You can help by becoming part of the movement. The first step, if you haven’t already taken it, is subscribing to this podcast. You can do so using the podcast app on your iPhone or Google Play on your Android device. Or go to iTunes and be sure to rate and review us while you’re there. Stacey: Follow us on Twitter at US Term Limits. Philip: Whatever else it did or did not accomplish, the November sixth elections propelled the term limits movement forward and we now have more committed, in writing, elected office holders than ever before. Thanks for being part of it. Stacey: The revolution isn’t being televised. Fortunately, you have the No Uncertain Terms podcast.